He hung around for about 20 minutes, he was as near as two or three feet from the pond edge. He was about eight feet long and moved very silently through the water. Heading off for a swim now, but in the sea not near the alligators.
" oh nothing could be finer than to be in Carolina in the morning "
Super duper Jemser. I think the signwriter could,ve saved himself some ink. 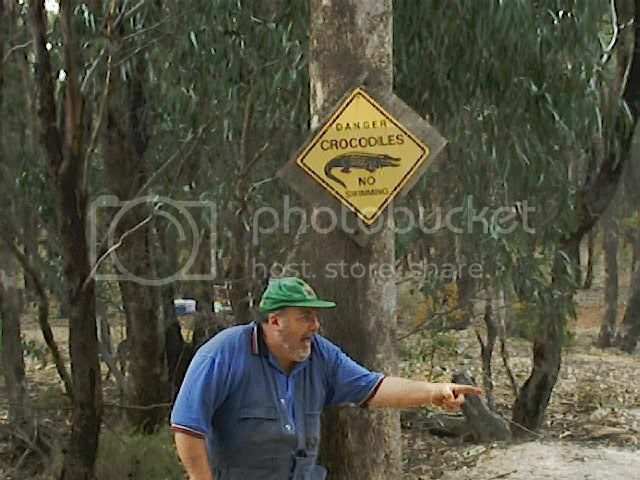 Anyone who thinks its ok to "Approach, feed or harass " an alligator .... well they,d probably be highly insane and wouldnt bother reading that sign anyway! Thanks for the tax breakdown Jemser, the Sales Tax always gives me the pip in the US. Does the house have a septic tank or is it connected to the mains? way you can see where and why soup kitchens are needed in some states. Jemser you should have asked him to smile for the camera Great Pic's. Wow Jemser he'd a put me off me brekkie..
Snowhite wrote: Jemser you should have asked him to smile for the camera Great Pic's. Janey mac he looks positively evil I got shivers looking at those pics. There's NO WAY I would be able to stay anywhere near there.....jeepers!!! "Do not approach , feed or harass"
Dancer wrote: "Do not approach , feed or harass"
Looks like you're having a great holiday,enjoy. Great idea for the Tshirt Make mine White with Blue writing!! Feck the Knitting Dancer, you could be on to something here. Make mine White on Black please. Omg! Look at the size of that crocodile!!!! The Victoria Bitter cap looks great on ya, Spud. Jeez, an' I was getting thirsty looking at it. Thanks Strum for the gorgeous T shirt...made for me. How do you Irish lads cope with learning all about alligators and snakes and bull frogs etc I'd loose my life..there were flying yokes only like butterflies in Austria but I was screaming my head off!!!. I was only in Australia once but hadn't done any research and it wasn't till I was home that HID said good job we didn't see too many snakes !!!! Rocker, to paraphrase the girl in the film "Kangaroo Jack" - "of the 10 deadliest snakes in the world, we've got 7 of them". Went into Charlston yesterday to look around the downtown area. It was very like a European city with pavements and lots of littl shops and some very fine architecture. We went on a touristy carriag ride with guides telling you about the history of the city and we walked though the Market area. It was very hot, about 32 degrees. Here are a few shots that itook f the city. Later on we went to Patriot's Point and viewed the USS Yorktown from the dock. It is an aircraft carrier now decommissioned and used as a floating museum. We didn't go aboard as we were booked on a dinner cruise boat trip around Charleston Harbour. Here are the last few shots for today, because it' almost lunchtime here. Hope all is going well Jemser..scary stuff. The USS Yorktown was that berthed in NY in the early '90s I wonder??? ?